You’ll feel equally as good about making this salad as you will about eating it. You only need about 10 minutes to make it; 15 minutes, at most, if you’re not as skilled with a knife. Not only will you feel good about the fact that this is so quick and easy to prepare, but you’ll also take great satisfaction in knowing that you’ve prepared something tasty and healthy for your friends and family to enjoy. I’d like to think that even if you aren’t a fan of raw tomatoes you might be persuaded with this dish. I find white wine vinegar enhances the natural sweetness of tomatoes. Don’t try making this with regular distilled vinegar, it’s far too tart. I prepared this salad with both flaxseed and olive oil. I used olive oil for its flavor and flaxseed oil for its incredible health benefits. I also used fresh dill for this recipe, and although I haven’t tried it, I imagine that dried dill could work as well. I would use about a tablespoon of dried dill to start. 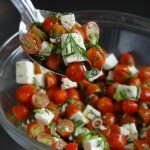 Add the tomatoes, scallions, dill, white wine vinegar, olive oil, flaxseed oil, sea salt and pepper to a medium mixing bowl. Stir to combine ingredients. Then, add the the feta and gently toss the salad, being careful not to break the feta cubes. Check for seasonings. 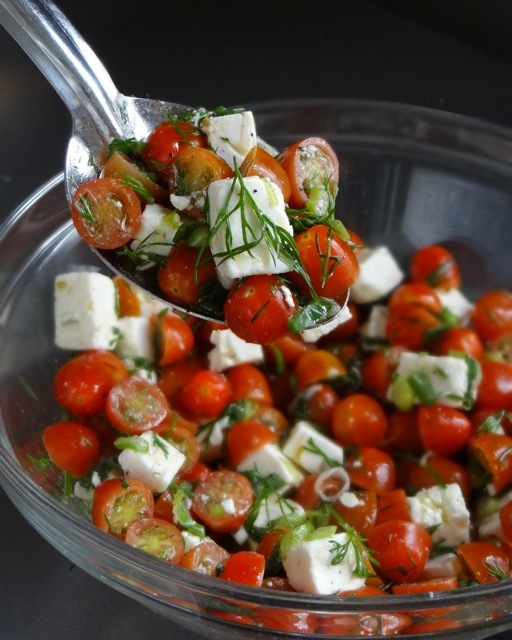 You may need to add a pinch of salt depending on how salty your feta is. Serve chilled or at room temperature.